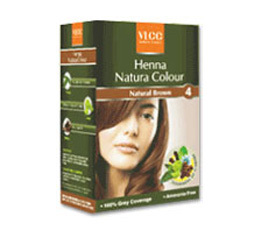 Buy VLCC Henna Natura Colour - Provides Natural Hair Color, Nourishing Hair & Conditioning Hair, Stops Hair Fall, Prevents Premature Greying. Henna Natura Colour is a natural hair colouring treatment that is made of leaves from select henna plants of Rajasthan, carefully blended with various herbs to provide nourishment & conditioning, along with deep rich colour. Henna Natura Colour is a modern concept hair color which provides natural color. It effectively provides full color coverage on hair, nourishes from within and conditions hair leaving them smooth and lustrous. Since the ancient times henna is well known as therapeutic home remedy in various hair applications. Over the years it has been used as natural/herbal hair color and has been a key ingredient in formulation of various hair packs, oils and cleansers. Add ½ cup of luke warm water and mix them to make a uniform paste. Apply evenly on full length of hair using brush and comb. Rinse off throughly with luke warm water. Do not use colour if you have applied henna in last two months. The natural properties of Hibiscus have been valued since ages. It provides a deep rich colour and vitality to hair. It has essential nutrients to promote hair growth so that you can show off beautiful lustrous tresses. Bhringraj is a proven ancient herb rich in proteins, named as "king of hair". It nourishes the scalp and strengthens hair to promote growth and prevents greying. It revitalizes hair and makes them darker, longer and luxuriant. Coffee is a natural colourant, which lends a beautiful blooming brown colour to your hair. It adds depth and dimension to your colour. Coffee also has a natural property which gives extra shine to the hair. Now enjoy your new luscious dark locks.